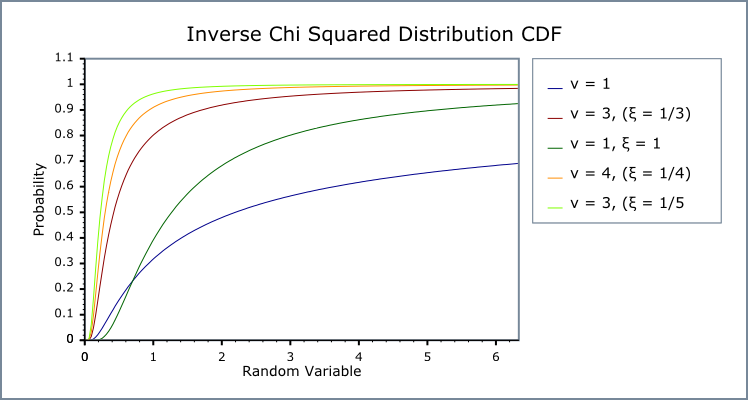 inverse_chi_squared_distribution(RealType df = 1); // Not explicitly scaled, default 1/df. inverse_chi_squared_distribution(RealType df, RealType scale = 1/df);  // Scaled. RealType degrees_of_freedom()const; // Default 1. RealType scale()const; // Optional scale [xi] (variance), default 1/degrees_of_freedom. The inverse chi squared distribution is a continuous probability distribution of the reciprocal of a variable distributed according to the chi squared distribution. The sources below give confusingly different formulae using different symbols for the distribution pdf, but they are all the same, or related by a change of variable, or choice of scale. Two constructors are available to implement both the scaled and (implicitly) unscaled versions. The main version has an explicit scale parameter which implements the scaled inverse chi_squared distribution. A second version has an implicit scale = 1/degrees of freedom and gives the 1st definition in the Wikipedia inverse chi_squared distribution. The 2nd Wikipedia inverse chi_squared distribution definition can be implemented by explicitly specifying a scale = 1. Both definitions are also available in Wolfram Mathematica and in The R Project for Statistical Computing (geoR) with default scale = 1/degrees of freedom. Inverse chi_squared distribution functions Weisstein, Eric W. "Inverse Chi-Squared Distribution." From MathWorld--A Wolfram Web Resource. 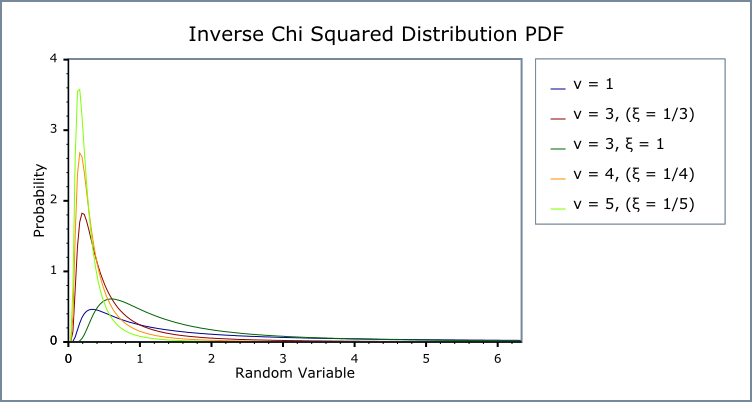 Inverse chi_squared distribution reference Weisstein, Eric W. "Inverse Chi-Squared Distribution reference." From Wolfram Mathematica. The inverse_chi_squared distribution is used in Bayesian statistics: the scaled inverse chi-square is conjugate prior for the normal distribution with known mean, model parameter σ² (variance). See conjugate priors including a table of distributions and their priors. See also Inverse Gamma Distribution and Chi Squared Distribution. α= ν /2 and β = ½.
inverse_chi_squared_distribution(RealType df = 1); // Implicitly scaled 1/df. inverse_chi_squared_distribution(RealType df = 1, RealType scale); // Explicitly scaled. Constructs an inverse chi_squared distribution with ν degrees of freedom df, and scale scale with default value 1/df. Requires that the degrees of freedom ν parameter is greater than zero, otherwise calls domain_error. Returns the degrees_of_freedom ν parameter of this distribution. Returns the scale ξ parameter of this distribution. Unlike some definitions, this implementation supports a random variate equal to zero as a special case, returning zero for both pdf and cdf. The inverse gamma distribution is implemented in terms of the incomplete gamma functions like the Inverse Gamma Distribution that use gamma_p and gamma_q and their inverses gamma_p_inv and gamma_q_inv: refer to the accuracy data for those functions for more information. But in general, gamma (and thus inverse gamma) results are often accurate to a few epsilon, >14 decimal digits accuracy for 64-bit double. unless iteration is involved, as for the estimation of degrees of freedom. In the following table ν is the degrees of freedom parameter and ξ is the scale parameter of the distribution, x is the random variate, p is the probability and q = 1-p its complement. Parameters α for shape and β for scale are used for the inverse gamma function: α = ν/2 and β = ν * ξ/2. Bayesian Data Analysis, Andrew Gelman, John B. Carlin, Hal S. Stern, Donald B. Rubin, ISBN-13: 978-1584883883, Chapman & Hall; 2 edition (29 July 2003).